Update: Shout out to LaBelle. She’s lost 40 pounds. 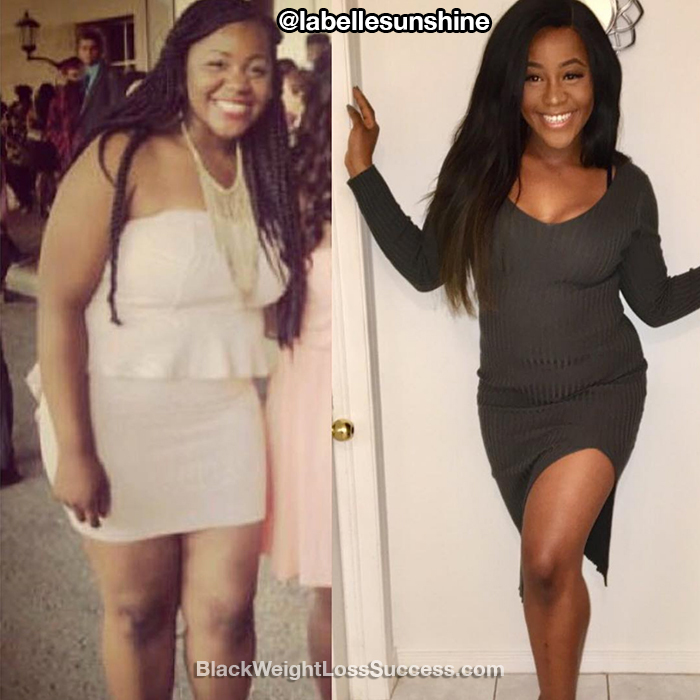 Transformation of the Day: LaBelle lost 32 pounds. She’d always been the big girl of the group, unable to wear the clothes she liked and faced with insecurities. 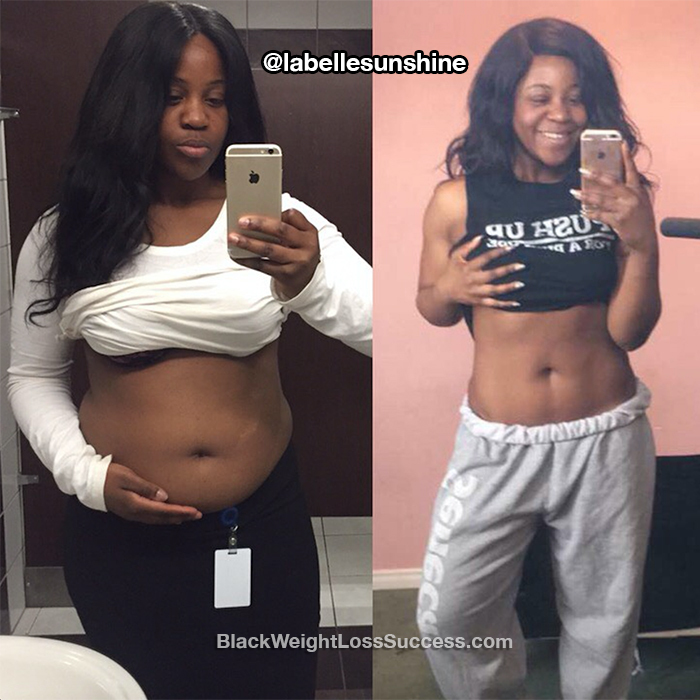 In the Summer of 2016, she began to make good on a promise she made to herself to get fit. It all started with her workplace gym. She learned how to love herself and that slow and stead wins the race. Growing up, I was always the big girl of the group. Whenever it was time to try something on, it would always fit my sisters or cousins and I would always be left out of the fun, simply because things didn’t fit me. I hated going shopping because it was always so hard for me to find things to wear. Whenever it came to guys, I was never the pretty girl… always the cool friend. I grew up seeing guys go more for my sisters because they were thinner than me. I was always insecure about my weight, so whenever a guy would go for me, I tried to hold on to them. The way I looked at it, I was lucky even to have a guy look at me. I would always look at other girls and wish that I looked like them. Right now, I am 21 years old. I always told myself that by the age of 25 I would lose the weight. That was the promise I made to myself. One day, I was looking at girls on Instagram and I kept on saying, “body goals”. For some reason, I got upset. I thought to myself, “Why can’t I be like that.” or “Why can’t I look like that. What is stopping me.” I tried to lose weight many times, but was never successful. I tried so many things, even to the point of even making myself vomit. I wanted to lose weight so badly that I would do anything and try anything. Summer 2016 was when my life changed for the better. I got a new job and in the same building was a gym inside. I would always see my co-workers going to the gym during lunch time. It was then that I told myself it’s either stay this way forever or take the opportunity that God had given me and use it to the fullest. I applied for the gym and at that time I honestly had no clue what I was getting myself into. However, I didn’t start eating healthy right away. I was still eating pretty bad at the time. It wasn’t until a month into this journey that I actually began meal prepping. My coworkers and I decided to enroll in a group bootcamp at the gym. It was 3 times a week, so on the remaining days we would do our own little workouts. At that time, I would just follow whatever my co-workers did. I had no idea how to use the machines. I started my journey during the summertime, so after work I thought it was a waste to just go home and do nothing. I started going to the gym after work. That meant I would be going to the gym twice a day (at lunch and after work). I was so addicted. My job was two hours away from home. There would be times when I would get up and commute just so that I would be able to go to the gym. When I went to the gym after work, I did a lot of running. I started with running for 20 minutes and now I do 30. Running was easy for me because that was the easiest workout for me. For 7 months of my journey, I only ran and participated in the group bootcamp. After I become more knowledgeable on what I was doing in the gym, I started to have “leg day”, “back day” and also “arm day”. Each day I would focus on one of those muscle groups and finish with abs and 30 minutes cardio. I started to build more muscle. When I first started, it took me a month to start eating healthy. I remember the first time I meal prepped. I didn’t want my family to touch my food, so I hid it in the cabinet. Silly me, hadn’t thought of it going bad. I was only able to enjoy my Monday meal; the rest all went bad. I definitely got discouraged because I wasted all that money on food and wanted to give up so badly, but I was determined. I had the mindset to invest in myself, because in the long run I would be happy. I didn’t allow the failure to stop me. I started meal prepping every week. There are those weeks when you won’t have money for meal prep and I have been there, trust me. But you shouldn’t let that discourage you. Try finding the healthiest things around the house and do something with what you have. When I started, I only did a 1,200 calorie diet. The only thing that is different now is that I don’t eat bread. I cut out carbs and sugar. I also don’t drink or eat dairy. I don’t remember the last time I had sugar. My tea is all black and so is my coffee. Starting off, I drank 2 liters of water. Now, I drink around 3-4 liters of water a day. I also have 2 cups of green tea everyday. My starting weight was 200 pounds. Now, I weight 168 pounds. (height: 5’7″) In total, I have lost 32 pounds. I feel as if I’ve lost more than that because I am building muscles and that affects the numbers on the scale. I started my journey in May 2016, and it has now been 9 months of transformation. Eating right and going to the gym is only 20% of the challenge. I never thought that I would have to battle with my mind so much. There would be days when I got up and felt so skinny. Ther are other days where my mind would start playing tricks on me. I really had to fight with my mind and tell myself to keep going. At first, I was so fixed on the scale and wanting to see results so bad that I would get discouraged whenever I didn’t lose enough weight, had a bad gym day or ate something bad. I had to tell myself that this is a lifestyle change. If I had a bad day it’s okay, because tomorrow will be a good day and if I continue on this path I will eventually lose weight. I stopped focusing on the scale, because one day it would say X number and the next day it would say another number. Instead, I started to focus on how I felt and took pictures to compare. I have only lost 32 pounds but that’s a dramatic difference when comparing my before and after pictures. I stopped looking at other people’s journey or comparing their weight with mine and ran my own race. I still do battle with my mind from time to time, but I’m learning self love. You will never be successful in the journey if you keep being hard on yourself and don’t love what you see in the mirror. This journey will just be so much harder, because you will just continue to be hard on yourself to the point where one day you will just give up. If you don’t see improvement quick enough, you’ll get frustrated. I see my journey as going slow and steady. I’m no longer so hard on myself. Whenever I see change in my body to me that’s just a bonus, because I’m in love with the way I look. Do I want to better my body going forward, of course. That’s why even though I love my self physically I still want to improve. Mentally, I’m stronger. I believe in myself so much more and will never allow someone to look down on me. I used to be so weak minded but not anymore. There is so many times where I had to pick myself up from tears and tell myself to keep going. So many times when I wanted to just quit but I never allowed myself to. That made me stronger as a woman. I get more male attention than I did before, but I’m not as easily fascinated as I used to be. Now, I know and see my worth. Health wise, I love to be active, go on hikes or even runs. I feel so much better in my body when I stick to a healthy diet and healthy activitites. The advice that I would give someone who is ready to start their own fitness journey is to be mentally prepared. Sometimes you will have a bad gym day or even eat really bad, but don’t allow yourself to get discouraged. There will be days when you feel skinny and see results, but the next day you may feel like you’re back to day one. That’s okay, keep going. This journey is all mental. What the mind thinks the body follows. Always believe in the power of bouncing back. Don’t be so hard on yourself. Remind yourself that this is a journey. There will be times when you just want to rest. Allow yourself to do so, but don’t give up. You can either be your biggest critic or your biggest cheerleader and most days you will be your biggest critic. That’s when you must remind yourself of why you started and allow that to be the reason that you keep going. Also, don’t expect the world to cheer for you the whole way, even friends and family. You may think that everyone will celebrate with you when you lose one pound or two, but no it doesn’t work like that. The world will only celebrate with you when they see a big result, so celebrate your own little milestones. Honestly, at first I thought that the people around me would always be my cheerleaders. But that’s definitely not what happened. I had to be my own motivation and cheerleader on this journey. I did have my family who were there to support me and tell me to keep going. My mom was my biggest supporter. On the days when I had no one, I held onto God and myself. || Swipe left for more: I have finally for the third time in my journey mastered my plateau! I have been the same weight for almost two month now! Once I got back into running I started to loose weight again, I honestly don’t know what it is but my body looses weight quick when I run! Almost at my goal only 17 pounds away and I will be 50 pounds down! My journey is slow but that’s how I always wanted it to be, definitely not trying to gain the weight back. Wonderful Job& Beautiful Mindset! Keep up the great work! Proud of you keep it up… you look great!